The fabulous Jeanne made up a sketch for us to use this week, this is my card using it. I have stamped out Eskimo with Penguin and coloured them in with Copic markers adding glitter with my Spica pen. I have then cut them out with Nestabilities dies and added to base with 3D foam pads. The base has been made by layering up dark mauve CS with patterned paper and wrapping organza ribbon around. Greeting added in corner to finish. Check out Elizabeth's blog for all the other DT cards and the challenge for next fortnight! Thank you all so much for the lovely comments on the post below. I will be back at the weekend with some more cards and to vist you all! STAMPS: Elzybells Art Stamps. INK: Airondack Pitch Black. CS: Anita's, Bazzill Basics, patterned paper by Partners. ACCESSORIES: Organza ribbon by Ribbon Oasis, Nestabilities dies, Copic At You Spica glitter pen, Copic Markers. I love this card! The image is adorable and colored wonderfully. 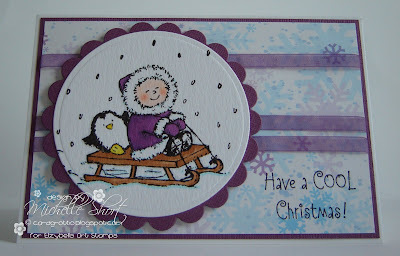 I love purples for winter cards too. love this! the purple is great!! Very pretty! Love the purple and blue! So wintery! I reaaly love this card , the image is so cute...I especially like how you have coloured it. Wow another stunning card Michelle. Fabby card Michelle, I love it, wonderful colours! Great take on the challenge. I have to smile whenever I see this cute image! Very cute card! Very nice coloring! Love your layout! Gorgeous card and I love the image ;o)!